V&M Flat Wild is designed by 2013 Bassmaster Classic Champion Cliff Pace to allow for a better hook up ratio in a small creature bait. 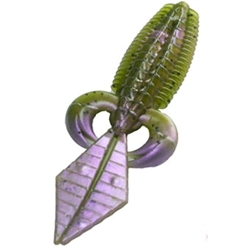 Cliff desgined the flatwild with a half ribbed and half stair stepped body to help push water on the fall and also to trap air to allow the bait to be more flexible which will allow for better hook penetration. The pinchers on the side allow a subtle attraction of movement while also having the darting action on the fall. The bait measures at 4” in the length.